Random Panel: Worst. Detective. Ever. 10 Responses to Random Panel: Worst. Detective. Ever. He’s probably taken the detective test half a dozen times, and still can’t understand why he doesn’t pass. At least Batgirl wore a MASK. 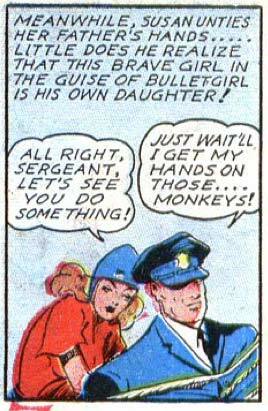 Bulletgirl just has a goofy helmet. And she’s untying him, in broad daylight, and talking to him. I’m not saying Gordon’s the sharpest stick in the forest, but this guy’s in a league of his own. @Niall: I believe Batgirl also wore a wig to help conceal her identity. @Everyone: Have y’all seen the Batgirl Barbie doll? Talk about a shock if he ever DOES get his hands on her monkey! She’s not the only bulletheaded individual in the family ….